Bits and pieces from around the NYC web. 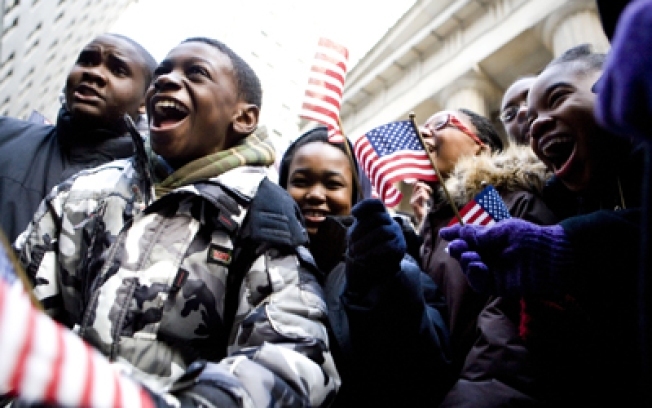 New York City's schoolkids watched history unfold with inaugural festivities today. Hey, did you hear about the new president? City Room looks at how the day unfolded at New York City schools. Coney Island's rezoning nonsense can stuff it: Hot dog purveyor (and site of the storied annual July 4 hot-dog eating contest) Nathan's Famous isn't going anywhere, thank you very much. New area restaurants getting taste of recession, freaking out. Brooklyn's Children's Museum welcomes visitor number 100,000. Over in Greenpoint, it's the 1970s all over again. Speaking of the '70s, Barkley L. Hendricks' Birth of the Cool exhibit opens in Harlem. Check out Gothamist's gallery. Following up on yesterday's news that Park Slope parents are hopping mad over getting ticketed for riding bikes on the sidewalks with their kids: more pissiniess! Tonight's hottest tickets? It's down between the Bell House Brooklyn Inaugural Ball and opening night of Will Ferrell's You're Welcome, America.